When AirBnB launched their “Live There” campaign in April, I thought they were featuring an idealized scenario. I’ve dreamed of traveling to some exotic location and staying with a local family who could show me their town like no hotel concierge ever could. I would love to eat at the local hole in the wall and discover incredible foods that only someone who lived in the area knew. How wonderful it would be to discover a small gem that I’d never find in a travel book. I have booked a room with AirBnB several times in the past, but all of them were pretty much low-cost places for me to stay while traveling. All of the hosts were nice, rooms were neat, but I would not consider it living like a local. Is that AirBnB local experience really out there? At the end of April, I booked a room through AirBnB in New Orleans to attend a conference and photograph the musicians at the New Orleans Jazz & Heritage Festival. I searched the site and found a place that was a third of the price of a hotel stay and within a reasonable bus ride or Uber to the main attractions. When I arrived, the place was a bit better than most bedrooms that have I stayed in – it was a small studio with a kitchenette that had a refrigerator with some juice, milk, and enough food for my first breakfast. Nice touch. After a couple of days passed, my host asked me if I was interested in attending ChazFest – a small jazz festival made up of mostly local musicians, the day before the official JazzFest. She knew I was in town to photograph musicians and this gave me a perfect chance to photograph them up close in an intimate venue. If I stayed at a hotel, I would have never found this festival. She knew about it because she was a musician playing in the festival! The musicians were incredible, the local food was great and the cozy atmosphere, which was basically someone’s back yard with two music stages, was perfect for hanging out and listening to music. During the official JazzFest, my host offered to give me a ride to the festival since she was also performing with one of the acts. She walked me through the schedule, giving me recommendations on the best musicians to see throughout the day. When the festival was over, as we headed back to her car, we stopped by to tailgate with a bunch of the musicians who were hanging out in the parking lot. It was incredible! I have visited New Orleans nearly a dozen times because of my love for the culture, the music, it’s history and the food, but I had stayed at a hotel each time and didn’t really get beyond the tourist experience. I had an awesome local experience as my AirBnB host provided me with great insider tips and we had great chats along with her boyfriend who was a Creole who was raised in the area. So yes, it really is possible to live like a local and sometimes get a hyperlocal experience. But was it just a fluke? I enjoyed my experience so much I set out to see if I could deliberately replicate the local AirBnB experience. My flight didn’t leave for another three days after JazzFest so I decided to drive up to Cajun country in Lafayette. 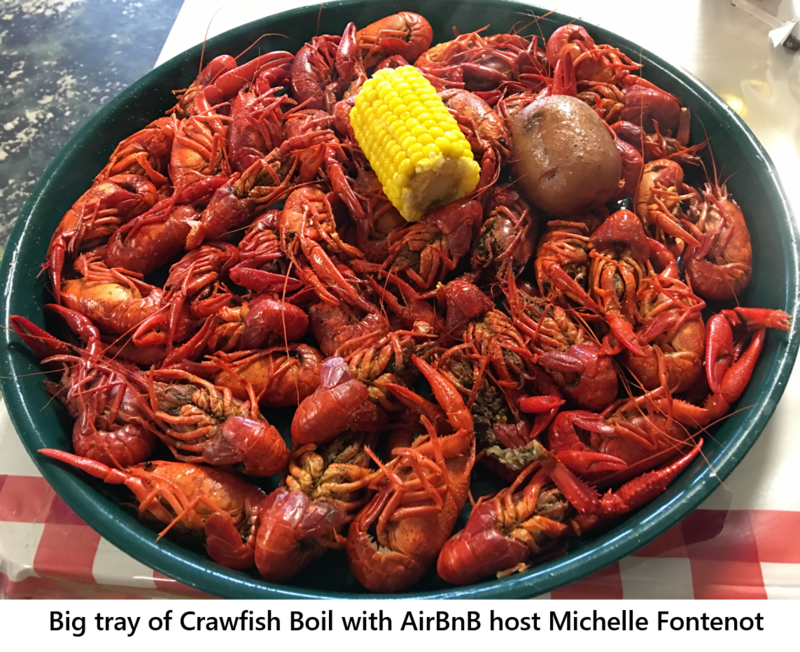 When I booked my second visit, I found a host who had received several rave reviews for her Cajun home cooking. When I arrived we had two days of incredible local meals and I got to chat with her Cajun friends who she had invited over on both evenings. So, not only was I able to find a local AirBnB experience but with a little more effort and attention to detail, I was able to replicate a great experience on my next stay. I don’t think I will always want these kinds of great experiences every time I travel. I value my privacy and many times I’m just looking for a reasonable place to lay my head. And just because I had awesome experiences with these two hosts, we also had common passions in music and food. Even if they were both super hosts, it doesn’t mean that the people staying with them will share their interests. Do your research – read the host’s biography and their reviews. Many hosts rent their space for the money and don’t expect to spend much time with their guests. That’s okay for many but if you’re looking for that local experience look closer for clues on common interests and comments about the experiences guests had with their host. Be open, be friendly but respect your host’s boundaries – feel out the host when you first get in. I’ve always had friendly and helpful hosts but get a feel for your rapport with them to see if they’re open to hanging out and chatting or if they want to keep some distance. It’s like a first date, you’ll get more when you show interest in what the host cares about than what you can get from the relationship. Try living outside the box – finding common ground is great, but memorable experiences are better. Be open to finding hosts that are completely different than you. Push your comfort zone whether you’re halfway across the globe or doing a short stay-cation. Provide basic travel resources – I would imagine that most of the people renting your space are not from the area. My host in New Orleans had a bookshelf of various travel books from common tourist guides, backroad travel books, photography books and history books of the area. She had a collection of brochures for popular landmarks and the latest entertainment newspaper. Know the restaurants in your area – be able to recommend the good places for breakfast, lunch and dinner within walking distance, within a couple of miles and up to 5-miles away. I’ve had hosts recommend that I eat at Dennys! Really? If I’m passing through, help me find a place that I’ll remember. Help me find wonderful foods that I can’t find in a national chain. Even if it’s a hole in the wall with something special. List the things you enjoy in your biography – it will make it easier for guests with common interests to find you. Create memorable experiences – It doesn’t have to be fancy. Sometimes being helpful is all we need. If you’re open to entertaining your guests it will show in your reviews. The founders of AirBnB made lifelong friendships with the first people who stayed with them and I know where I’m staying the next time I’m back in New Orleans. So it is possible to have a great local experience using AirBnB. 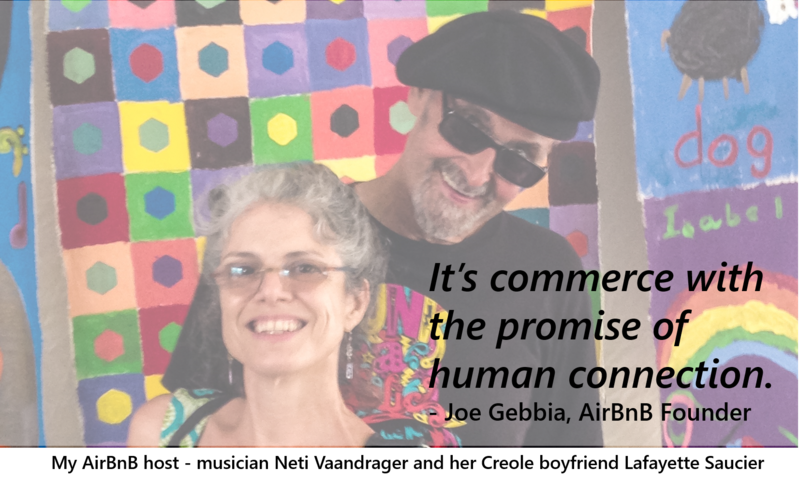 As AirBnB co-founder, Joe Gebbia puts it, “it’s commerce with the promise of human connection.” Many hosts are great with managing the transactional part of the stay. With a little work and desire, many of them can help facilitate the human connections. As guests, we can do a little bit of research beyond the room and the cost to see if the host is open to providing interesting experiences. In an increasingly digital-centric world, it will be our human experiences and connections that will define us. This entry was posted in Customer Centricity, Customer Experience, Customer Satisfaction and tagged AirBnB, Customer Experience, Customer Satisfaction. Bookmark the permalink.